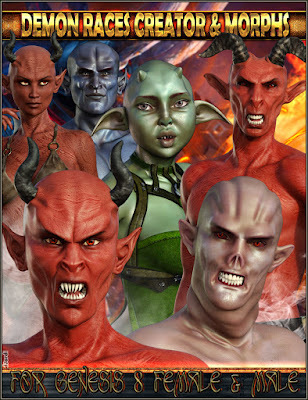 EJ Demon Races Creator and Morphs is a pack of 208 morphs: 105 for Female(s), and 103 for Male(s), and 10 Demon Races Presets (5 for Female(s) and 5 for Male(s)), available as full, head, and body morphs: Baphanael, Devil, Imp, Lamp Genie (Djinn), and Metademon. This pack also includes two kind of horns, and the morphs for the head sockets so you can add them to any character based on Genesis 8. Create all kinds of demonic creatures or monsters, like lamp genies, succubus, incubus, dimensional demons that like to play with cubes, Sci-Fi lab creatures possessed by evil, pure evils... everything you can imagine.